Every nation seems to have its own way of celebrating Christmas. Each one has special traditions and and customs related to this beautiful festival. And yet, some traditions are common to the festivities related to the occassion and universally celebrated by every nation during Christmastime. 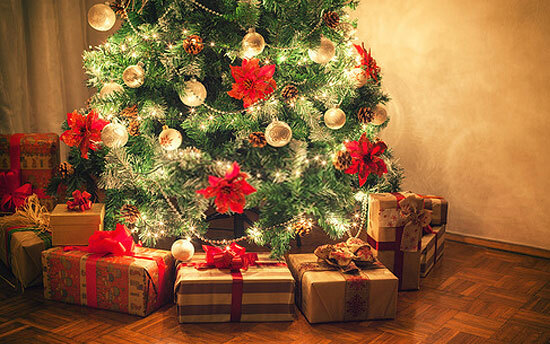 Here we bring you information on some of the common Christmas traditions like giving of gifts, Santa Claus, Christmas Stocking, Christmas trees and the like. Scroll down and read about it all. Merry Christmas to you all! Gift giving is perhaps the most well-known of all Christmas traditions in both Eastern and Western cultures. This wonderful tradition is said to have started from the time of Lord Jesus' birth. The Gospel tells us how, some days after the Lord was born, three men came to his house and gave him gifts that consisted of expensive items as gold, frankincense and myrrh. The custom continues to this day, with all of us giving something or other as presents to our friends and relatives. The arrival of Father Christmas or Santa Claus on the night before Christmas Eve is something we all know about. The tradition of Santa Claus is a highly popular one and has its origin in times long ago. The custom is said to have started with Nicholas, a Christian priest born in 280 AD in Asia Minor, who later became a bishop. A kind man, he always helped the poor and also loved children greatly giving gifts to them. As he did not like to be seen and talked about while giving away presents, Nicholas always gave gifts late at night, so that his identity would remain a secret. So he told children to go to sleep quickly or he would not come. Nicholas was eventually named the patron saint of children and sailors and came to be known as Saint Nicholas. The modern tradition of Santa Claus - the jolly, rotund bringer of presents at night, is said to have originated from the tale of this Saint Nicholas. Another legend has it that the Santa Claus tradition started from the tale of Father Christmas, the spirit of good cheer. The custom of celebrating Christmas Day on every 25th of December prevails in the major part of the western world. Though there has been a lot of dispute among theologians regarding the actual date of Jesus’ birth, popular Christian tradition holds that Lord Jesus was born on December 25, in the 4th or 7th BC. The ancient celebrations of the day have their origins in neo-paganism. Despite its godless origins, Christians are encouraged to celebrate every 25th of December as the birth anniversary of Jesus Christ. Families can attend worship services, singing Christmas songs and listening to the recitation of the Christmas story. The tradition of Christmas trees is said to have been started by Saint Boniface, a monk who went to Germany to preach in the 7th/8th century. He brought a fir tree to the people to decorate, and claimed its triangular shape represented God, Jesus, and the Holy Spirit. In England, the Christmas Tree is said to have been brought by Queen Victoria's husband, Prince Albert from his native Germany. The famous Illustrated News etching in 1848, featuring the Royal Family of Victoria, Albert and their children gathered around a Christmas tree in Windsor Castle, popularized the tree throughout Victorian England. By the late 19th century, the Christmas tree was brought to America by the Pennsylvania Germans. Today, Christmas trees are an indispensable part of Christmas festivities and every December, one can find hordes of them stacked up in Christmas gift shops across nations the worldover. Every year you hang up your stockings the night before Christmas, waiting anxiously for hours and waking up early in the morning to find them filled to the brim with small gifts and goodies. This splendid tradition is said to have started with the same Saint Nicholas we wrote about. Legend has it that Saint Nicholas once helped a poor man who was unable to marry off his three daughters by secretly throwing three small pouches of gold coins into the stockings that the daughters left to dry by the fireplace. With this timely gift, the father was ultimately able to get his daughters married. He also found out who his benefactor was and thanked Saint Nicholas with all his heart. This is how the tradition of Christmas stockings is said to have started in the European countries. Since that time children have been hanging Christmas stockings or putting out shoes, eagerly awaiting for gifts from Santa Claus. Today, children all over the world continue the tradition of hanging Christmas stockings.